knottie00dce67bf8b58728, knottie4e4aec69964ce09b, sararah, knottiea0c208e4eca3f74b, knottie5df810274851bda8 and 170 others joined. knottie6fb999ccf68cfa84, knottie116ca5870426f842, knottied1328a377205a057, knottie6ee0d18c21724048, knottie1997970393c1718c and 17 others were promoted to member. 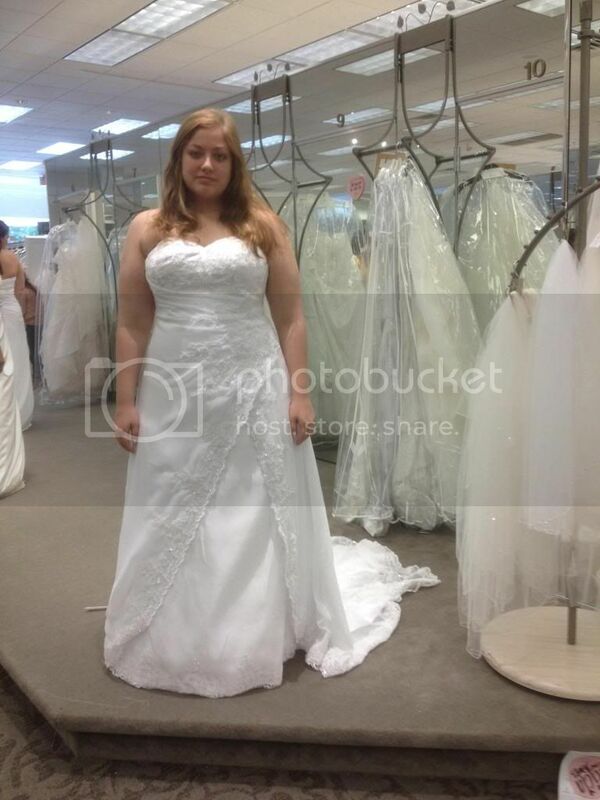 Show us your plus size wedding gown! The current "wedding dress thread" doesn't seem to be working most of the time, so I think it's time we start a new thread. We had one going, but l thought we would start fresh and make it a sticky now ! 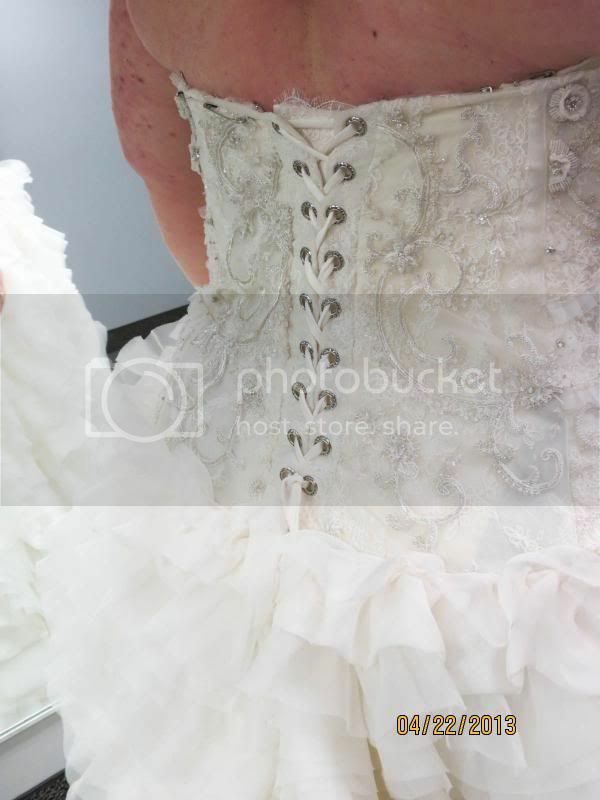 So, please share your wedding gown with us! If you have pictures of you in your dress, please post them! If you can, include the name of the designer and the style #. If you have a picture of the original designer's photo, please share that also. It is very helpful to see the difference between the gown on a model and on an actual plus size body. If you already posted your dress to another wedding dress thread, please repost it here! Here is mine, which I think most board regulars have probably seen it, but I'll get the ball rolling for this new thread! 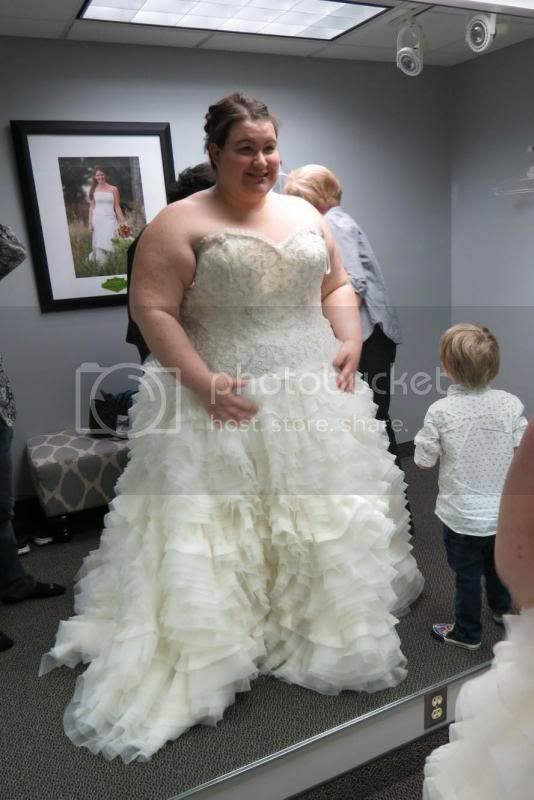 Re: Show us your plus size wedding gown! here is my bonny 1206. The top wasn't fitting right on the sample because apparently my breasts are like 3 sizes larger than the rest of me. I just said "HELL YES!!! to my dress this evening. I never thought I was "skinny" enough to wear something like this. I kept thinking that I had to hide all of my flaws under a big frumpy gown, but when my sweet consultant strapped me in... HELLOOOOO CURVES!!! I feel AMAZING in this dress and I can't wait to show the man of my dreams. I am SO SO SO excited!! [QUOTE]I just said "HELL YES!!! to my dress this evening. I never thought I was "skinny" enough to wear something like this. I kept thinking that I had to hide all of my flaws under a big frumpy gown, but when my sweet consultant strapped me in... HELLOOOOO CURVES!!! I feel AMAZING in this dress and I can't wait to show the man of my dreams. I am SO SO SO excited!! " Love your dress! You look beautiful in it. What dress is it? Thanks so much!! It's the 2013 Tiana dress from the AA Disney Princess Collection. I was married in 2005, but, I come back now and again to check the Jewish Brides board and noticed this board, so, I came in to check it out! 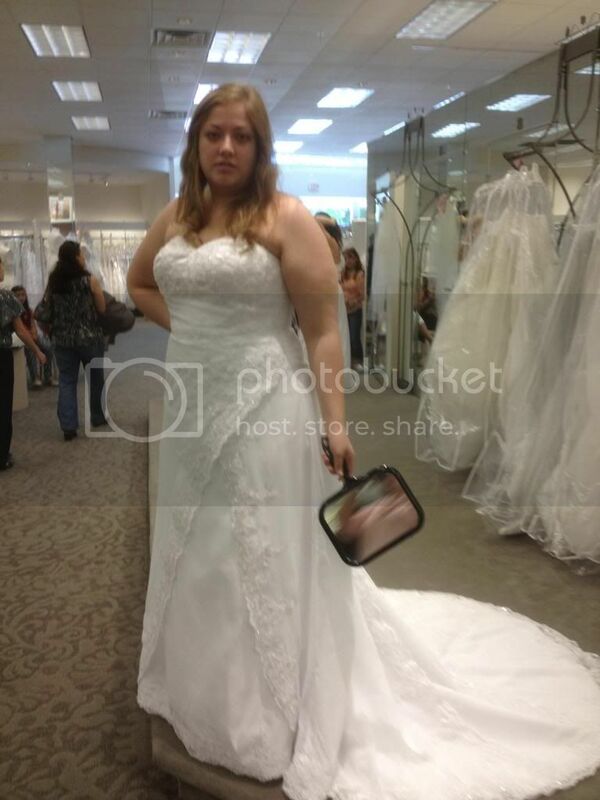 As I said, I was married almost 8 years ago, but, this is me in my dress. 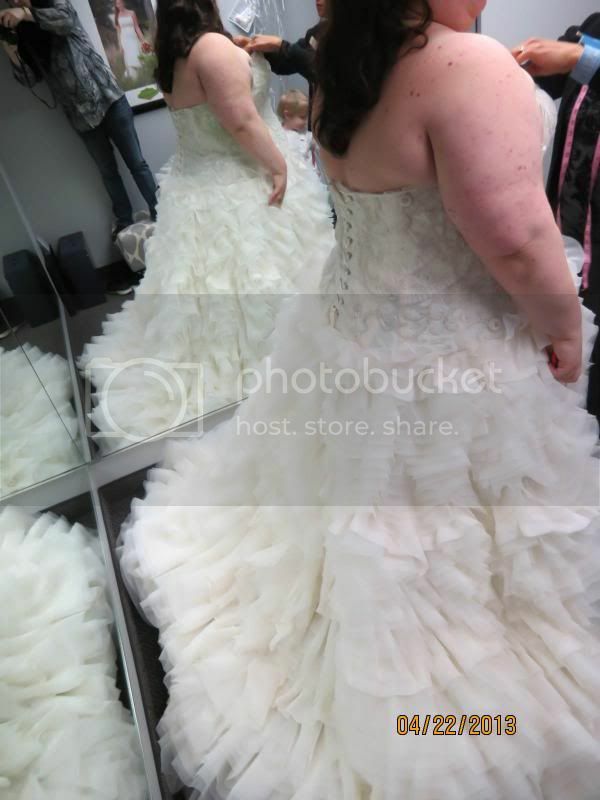 It was a size 18 from David's Bridal. The Knot lost my info, but, I've been married since 6/19/05! My Blog - "Helping Make Sense"
Beautiful Ckfragall ! I actually tried that dress on. I already had my Mori Lee, and I went into Davids Bridal to pick up my BMs dress, and it was the day your dress arrived at my DB. I had to try it on. I came VERY close to buying it and just selling my gown, but there was a risk it wasn't going to arrive on time, so I stuck with my original dress. I love the detail on it !! Congrats !! [QUOTE]Beautiful Ckfragall ! I actually tried that dress on. I already had my Mori Lee, and I went into Davids Bridal to pick up my BMs dress, and it was the day your dress arrived at my DB. I had to try it on. I came VERY close to buying it and just selling my gown, but there was a risk it wasn't going to arrive on time, so I stuck with my original dress. I love the detail on it !! Congrats !! Thank you!, I have been really surprised I haven't seen any pictures of a dress like mine on any of the boards I'm on. Even on our local site board . I'm so excited I can't wait for next march!! Here is my dress. I FELL in love with it. It was actually the first dress that I tried on, but I didn't want to choose the first dress so I actually went and looked at other dresses. I just could not get this one out of my head. I love it so much and I think that it flatters my body. Beautiful dresses ladies !!! Keep em coming ! I'm between two right now. Cannot decide at all. One is a White By Vera Wang from David's Bridal. Style Number VW351007 and the other is from Alfred Angelo Style Number 2362. We're having a May Wedding. Burlap and Lace theme. Charcoal and Canary yellow are our colors. What do you ladies think? EDIT: I can't get the pictures of me in them to upload. you should be able to add photos using the little green looking icon on the tool bar. On my screen, it is the third over from the right side. If that doesn't work, let me know. If you send me a PM, I can give you my email address and you can email them to me, and I'll add them for you. My mom only took a few, none of the back, but it's a corset. Looks great on you Allie !! I tried that dress on at DB. It's gorgeous! Thanks! I was surprised I liked the way it looked.